"If you're a cop and you're arresting people and you're confiscating the marijuana and keeping it yourself, that's bad. That's real bad," said City Councilman Doug Thomas. Sanchez:I think I'm having an overdose. and so is my wife. Sanchez: What's the score in the Red Wings game? 911: I've got no clue, i don't watch the Red Wings. Sanchez: I just wanted to make sure this isn't some kind of hallucination I'm having. "Nelson recalled that during his trip [on LSD] Phil was sweating, feeling isolated, reliving the life of a Roman gladiator, speaking in Latin and experiencing a spear thrust through his body." "Fortunately I was able to utter the right words, "Libera me, Domine," and hence got through it. I also saw Christ rise to heaven from the cross, and that was very interesting too (the cross took the form of a crossbow, with Christ as the arrow; the crossbow launched him at tremendous velocity - it happened very fast, once he had been placed in position)." You've never felt like the psilocybin mushrooms you ate were going to kill you? There is an interesting PKD link here: see how the officer's perceived reality (he thought he was going to die or was already dead) was more real to him than the reality that you cannot OD on pot - which he probably knew on some level. That's why I like the idea of this guy suddenly hearing metal teeth, as if his desperate attempt to escape his hallucination pushes him further into delusion. The point isn't whether or not you can OD on cannabis, or whether or not the cop knew that it was impossible. At this moment in his reality, he was afraid he was going to die and that was enough to incite such panic that he narked on himself. I just had to get my girlfriend to read this story out loud to make I wasn't hallucinating. Fantastic stuff. Thank God the dispatch officer he called didn't decide to mess with his head and give a result for the Red Wings game that was different to the one he could check on TV or radio for himself. 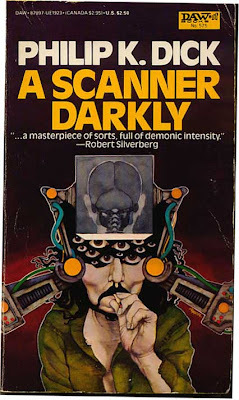 That Scanner Darkly cover is totally Johnny Depp. With lots more eyes, obviously. The operator sounds so incredulous, it's hilarious. "Have you guys been drinking??!! Are there any guns in the house??!! Do you have any dogs?? Cats??" Good ad for Vicodin, as well! welcome to the wonderland Gold , in here you can buy the wonderland online Gold, do you know that the wonderland money in the game is very important, if you had more cheap wonderland online Gold, I think you can get the tall level, quickly come here to buy wonderland Gold.